New York City: self-proclaimed pizza capital of the country. Upon hiring our head chef, a field trip was top priority, to share some of my favorite spots, and the standard I hoped to set us to. Manhattan is known for its thin crust, by the slice pizza, but Staten Island was the first place to introduce the brick oven, wood fired style. This winter I found a place I could stage (work for free for a limited amount of time) for a week. Half the experience was essentially “Dough 101”: just what I was looking for, complete with the duty of mixing and rolling 100 dough balls each morning. The other half was spent on the line making their self-proclaimed best pizza in the world (and I’m sure they’re the only ones in NYC to make such a claim). There is no better way to get good at something than by doing it over and over hundreds of times. You build muscle memory, speed, and confidence; but less obviously, you grow to understand the minutiae that can affect one pizza to the other; the way different quantities and qualities of toppings can affect the final product and interact with each other. This experience was invaluable, and at the end of the “class”, low and behold! They sell the very oven model I was using all week. While the idea of falling victim to a weeklong sales pitch didn’t initially sit well, there was no denying the quality and user-friendliness of the oven. Normally in a wood fired oven you need to pay very close attention to not placing a pizza in the same spot too often, and too soon, or it will mess with the radiant heat. This model has a slowly rotating stone base, so it’s never something to worry about. So we have that going for us. But, back to the field trip: I set Rick up in the same class in Staten Island by night, and we hit some of my favorite spots by day. He claimed it was impossible for him to ever get sick of pizza, but was eating his words by the end of day 2. We went to a few different brick oven spots, each delicious but with subtle differences that set them apart from one another. “American Flatbread” in Tribeca was on the heartier side, with a strong focus on various gourmet cheeses from Vermont, and local produce. I describe this style as “Farm Pizzas”. It reminds me more of my years spent living in Vermont, then an Italian export. 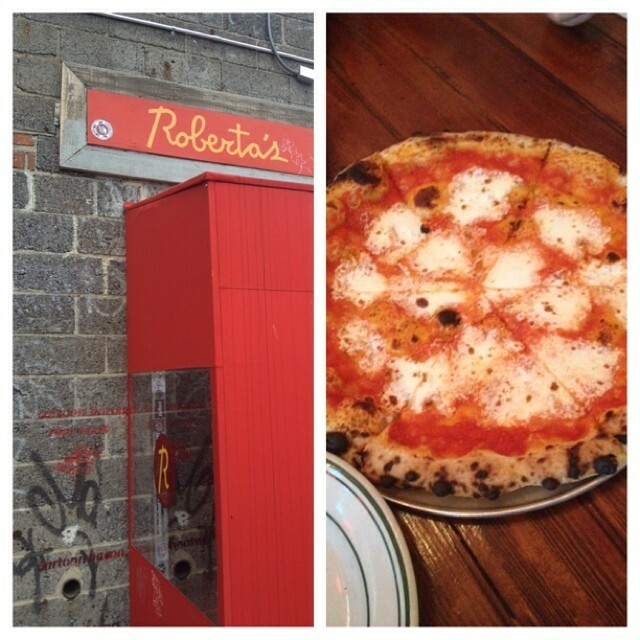 Another great place was “Roberta’s” in Brooklyn. The place most commonly recommended to me, it lived up to the hype. Lighter, and simpler then Flatbread’s, their style lends itself more to personal pies. The slices went down smoother, different, but the one commonality was the freshness and cohesiveness of the flavors. Throughout the weekend we got a great sense of the different directions we can take, and realized in the world of pizza, and food in general, there is no right or wrong style. Through hard work, experimentation, repetition, and sourcing the best ingredients we can find, our identity will evolve on its own.